Windsor Humane’s Pet-a-Palooza is this Weekend! 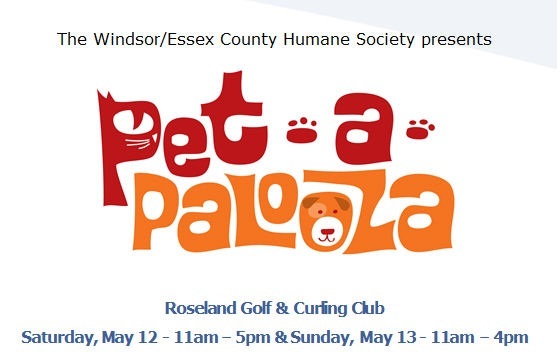 This weekend, the Windsor/ Essex County Humane Society is hosting their first ever Pet-a-Palooza at Roseland Golf & Curling Club. This two day event will feature pet-related businesses within Windsor & Essex County with the aim of raising awareness of the many resources that are available to pet owners and their furry friends. It’s billed as a fun-filled weekend created specifically for pets and their best friends. A variety of vendors will be lined up to show you their perfect toys, amazing one-of-a-kind collars and leashes, healthy and homemade treats to tantalize your pet’s tastebuds, unique pet-related gifts for the pet lover on your list, and trainers will be available to help you with idiosyncrasies your animals may exhibit. Both days will feature informative talks and contests for your animals. You’ll learn some nutrition tips, how to care for older pets, and more during this two-day event. Cost is only $3 for a day pass, $1 for children 12 or under, and pets are free! Please ensure that, if your pet is coming, they are on a leash or in a carrier at all times. Pet-a-Palooza runs Saturday May 12th from 11am – 5pm and Sunday May 13th from 11am – 4pm. Roseland Golf & Curling Club is located at 455 Kennedy Drive West in Windsor.